Edward: I’m so glad you agreed to come out with me. Bella: (shrugs) You sounded so normal enough on the phone. (mumbles) And I had nothing better to do. Bella: Nothing. So where are we going again? Edward: A special place downtown. Bella: What’s so special about it? Bella: (stares at him) You’re going to take those fake fangs out though, right? Bella opens her purse and takes a compact out. Edward: (snatches it out of her hand) This doesn’t have a mirror in it, does it? Bella: (glares at him) Yeah, why? Edward: Don’t open it. (he sniffs) Is that garlic I smell on your breath? Bella: (gasps) How dare you? Bella: (stands and grabs her compact) That’s it, I’m leaving. Bella: And for God’s sake, wipe the sparkle off your face. You look like you belong in a disco. Bella walks down the aisle toward the door. Edward gets up to follow her. Edward: That’s where I was taking you! A disco! Bella: (turns) Discos have mirror balls, freak! Edward stands in the aisle, confused, as Bella gets off the bus. Categories: fiction, Scecond Seat on the Right | Tags: Bella, dating, Edward, fanfiction, Flash Fiction, Funny, Humor, micro fiction, scene, short fiction, vampire | Permalink. Sounds like a really great book! Congratulations on the new release, John! Categories: Reblogs | Tags: #amreading, books, fiction, great authors, Hot New Releases, John W. Howell, readers | Permalink. Due-dates. I’ve always been bad with them. When I was in school, I always waited until the last minute to complete a project, and even now, when I have something to write I often do it at the very last minute. So it makes sense that I’d set myself up for a career in which I have nothing but due dates, right? Ha! Strangely enough, where my editing business is concerned I seem to have overcome that awful habit. But only as long as I stay off the Internet, which is, of course, my downfall. Nope, I must get up every dewy morning (and mornings that aren’t so dewy) and start work before I even connect. And I love it. I really do. The date that’s been on my mind most these days is tomorrow, and it has nothing to do with my editing business. Tomorrow, I’m having my very first book signing! 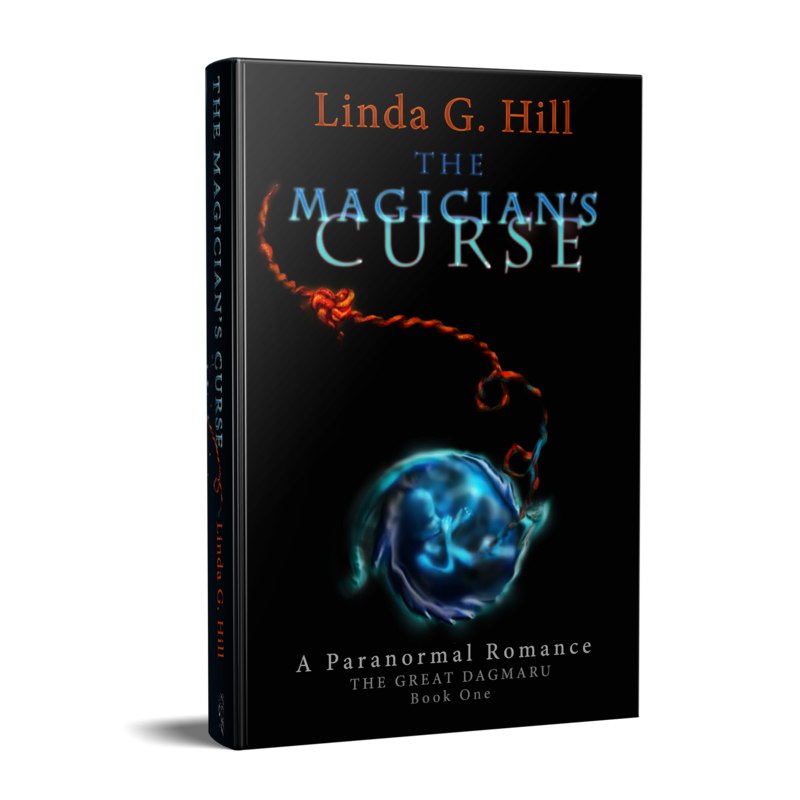 I’ll be signing copies of my novel The Magician’s Curse and giving away bookmarks. And where else than in the biggest book store in Kingston: Chapters! Kingston, where my story takes place! If my audience there can love what I’ve done with the setting, I’ll know I’ve done well. I so want to edit that last sentence. How ironic is it that I came up with a prompt rule that prohibits me from doing what I do for a living? Ugh, there I go again. I’m in serious doodoo here. I’d like to end this post by saying a huge thank you to Dan Antion for taking over for me this weekend. My stress levels over the upcoming event are already through the roof–I don’t think I could have coped without him. But he couldn’t, of course, let me get away without giving me at least one challenge: points. I need his points! And if you’re in the Kingston area, (and a lot of book lovers are this weekend, since the Kingston WritersFest is on) you need to come and see me at Chapters on October 1st, 2017 between 1pm and 3pm. Do it! Whatever you do! Categories: Blogging, Blogs, Life, Stream of Consciousness Saturday, The Great Dagmaru | Tags: #WritersFest, authors, book signing, Chapters Kingston, Kingston WritersFest, new authors, SoCS, The Magician's Curse, writing prompt | Permalink. Drommen sits alone by the window. Hillary approaches. Hillary: Hi! Mind if I sit? Drommen: (smiling) No, not at all. Jessica, right? Hillary: Riiiight, now I remember … So, what happened to your face? Drommen: Oh, just a little accident. Drommen: Yeah. I ran into a baseball bat. Hillary: Wow. You must have some pretty fierce enemies. Drommen: (shakes his head) Nah. A couple of guys on the bus decided they didn’t like me. Hillary: I’m surprised you came back. Drommen: (laughs) I’m never afraid to come on the bus. Categories: fiction, Scecond Seat on the Right | Tags: double entendres, Drommen, fetishes, Flash Fiction, Hillary, indecent propositions, micro fiction, personal injury, scene, short fiction | Permalink. 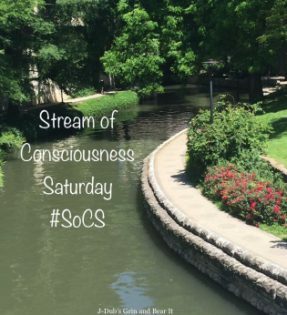 It’s Friday, and that means it’s time for your Stream of Consciousness Saturday prompt. I love saying that. Yes, you’re right, this is not Linda. This is Dan from No Facilities, filling in for Linda who’s out signing books (I hope she wears out a few Sharpies). Linda doesn’t like to burden you with a lot of preliminary stuff (which makes me wonder why she turns this over to me, but…) so, let’s get to the heart of the matter. Your Friday prompt for Stream of Consciousness Saturday is: “do/dew/due”. Use one, use two or use all three. If you start and end with two of them, you get bonus points. If you use all three AND start and end with two of them, you get Linda’s bonus points plus, I’ll match hers – from me to you. And, lest we all forget – Enjoy! Categories: Blogging, Blogs, Guest Posts, Prompt, Stream of Consciousness Saturday | Tags: fun, inspiration, SoCS, stream-of-consciousness writing, WordPress, writers, writing, writing prompt | Permalink. Note: Strong language, adult theme. Donald: (looks around to make sure no one is within earshot) Not a cure. I just wanted to know if I am. Robert: Right. And then from the psychiatrist’s office you went home and fucked your wife. Donald: But you forgot about the woman I met on the bus before the appointment. Robert: The … catalyst … you called her? Donald: Yes. She told me I might be (whispers) bisexual. Robert: Uh huh. So to prove that, you came over to my place after you did your wife and propositioned me? Donald: I went to the bar in between. Robert: So you’re an inhibited gay. Donald: (raises eyebrows) I’m a what? Donald: We’re still not talking about this. Robert: We weren’t doing much talking that night either. Donald: I mean at work. Robert: (rubs hands together) Yep! Donald: (frowns) What do you mean “yep”? Robert: (smiles) I think it’s time for a raise, boss. Categories: fiction, Scecond Seat on the Right | Tags: denial, Donald, extortion, Flash Fiction, inhibitions, micro fiction, Robert, scene, sexuality, short fiction | Permalink. Tilden: Why don’t you just feed Prescott? Deborah: I’ll wait ’til we get home. Tilden: But he’s hungry now. Deborah: I can’t feed him now. Deborah: Because we’re in a public place. Deborah: So, people don’t want to see me feed your brother. Tilden: But you said it’s natural. Tilden: So what’s wrong with it? Deborah: I don’t know, sweetie. Five minutes goes by with Prescott crying. Tilden: Prescott is really hungry, and he’s getting on my nerve. Tilden: Just whip it out and feed him. Tilden: That’s what Daddy says! Deborah: That’s when we’re at home. Tilden: Can’t I even say it in public? Categories: fiction, Scecond Seat on the Right | Tags: breast feeding, Deborah, embarrassing situations, Flash Fiction, micro fiction, scene, short fiction, taboo, things kids say, Tilden, toddlers in public | Permalink.